A Cloud Telephony service provider gives services like Calling, SMS, IVR etc. 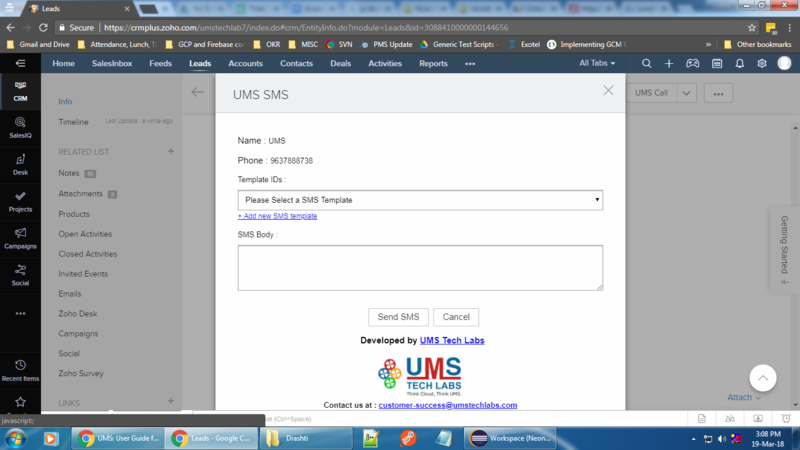 UMS’ Zoho CRM CTI App comes with features which integrate any Cloud Telephony Provider with ZOHO, in turn, helps improving Agent’s productivity and provides you with CTI (Computer Telephony Integration) records within ZOHO for tracking, monitoring, auditing and training purposes. Helps in monitoring Agent Productivity. Call and SMS Logs within ZOHO helps in tracking, monitoring and auditing. Go to ZOHO marketplace and search for “Exotel Telephony App” and click the App. On the app, page click on “Install” on the upper-right corner to begin the installation. Title: Name for the application. Exotel SID: Refer this link to get your Exotel SID. Exotel Token: Refer this link to get your Exotel Token. Exophone Number: This number would be displayed on customer’s mobile phone when you make an outbound call. Refer this link to get your Exophone Number. Exotel SMS Sender ID: Use a 6-letter Exotel approved sender ID from which your SMSes will be sent. Refer this link to get your Sender ID. Copy generated authtoken as shown in the screenshot below. Click on “Save” button to save your app configuration. 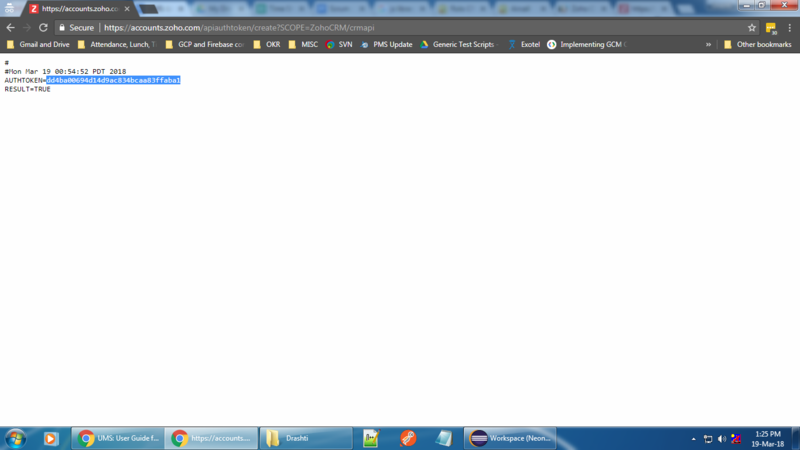 Once installed successfully, refresh your page for the changes to take effect. Go to any lead/contact to view this app. You will see the custom button on Lead/Contact view page. 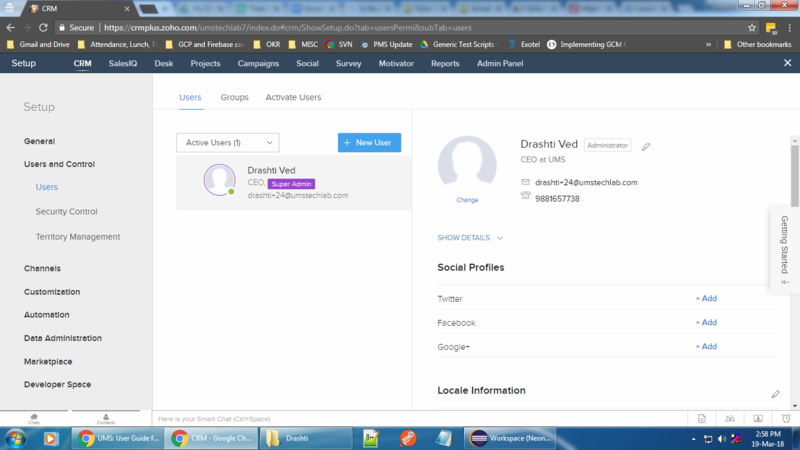 Before using the ZOHO CRM CTI App make sure to update your profile with a phone number, which will serve as the agent’s phone number in case of click to call.For updating your profile click on Setup > Users. Select your profile to update your number. 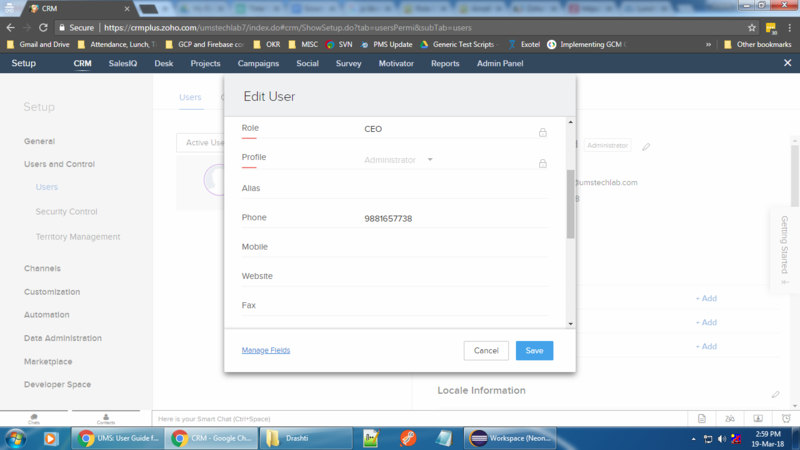 To add phone number of an agent, click on edit as shown in the following image.You can add the phone number for the agent. 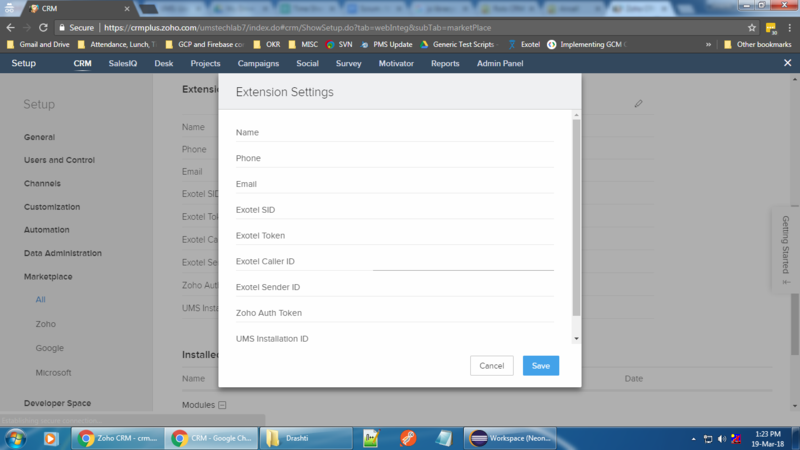 This feature lets you make outgoing calls to the customers from their Lead/Contact in ZOHO CRM. 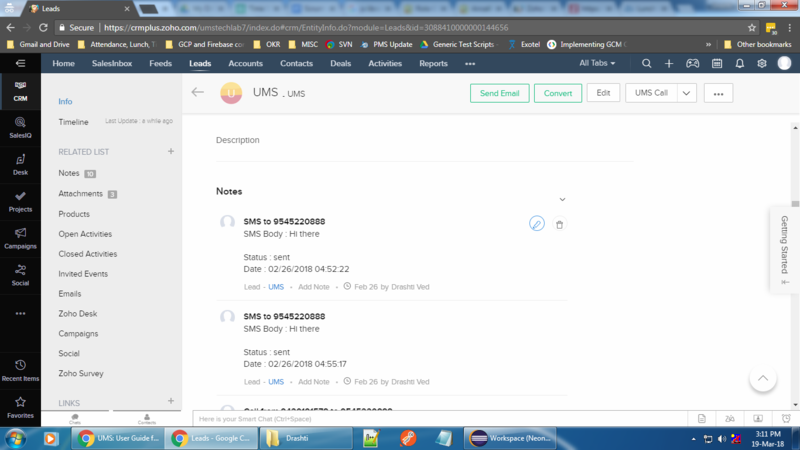 When you click on the “UMS Call” button, the first leg of the call is patched to the agent(number configured into the logged in account) and the second leg gets patched to the customer when the agent receives the call. Exophone number configured at the time of installation serves as the caller ID for the call. 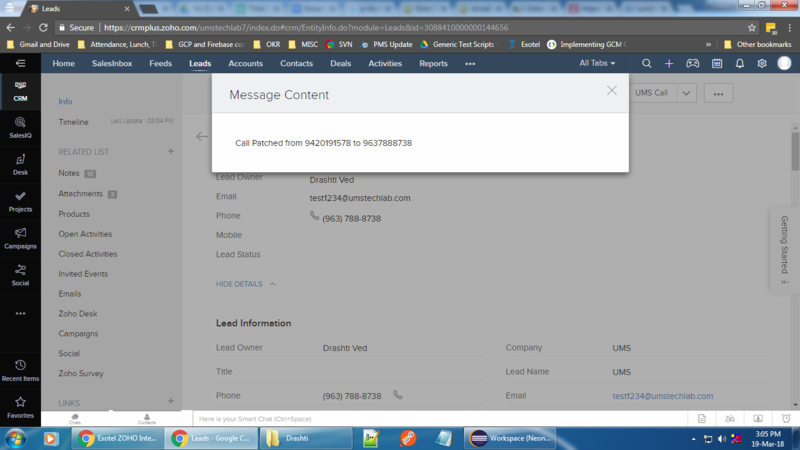 This feature records all the incoming and outgoing calls for each Lead/Contact. Call details are recorded in the Notes section. Date-Time: date and time at what time call was made. Recording: Recording URL of the conversation of the call or “Missed Call” in case the call was missed. For every new template/ SMS content add it to your template list. This helps you reuse a particular template in future. To add a template to your template list, click on “Add a new SMS template” link. Template name: Name of the template you are adding. This is a mandatory field. Template body: This is where the content of the SMS goes. This is a mandatory field. Once all the template details are filled, click on “Save” to save this template. 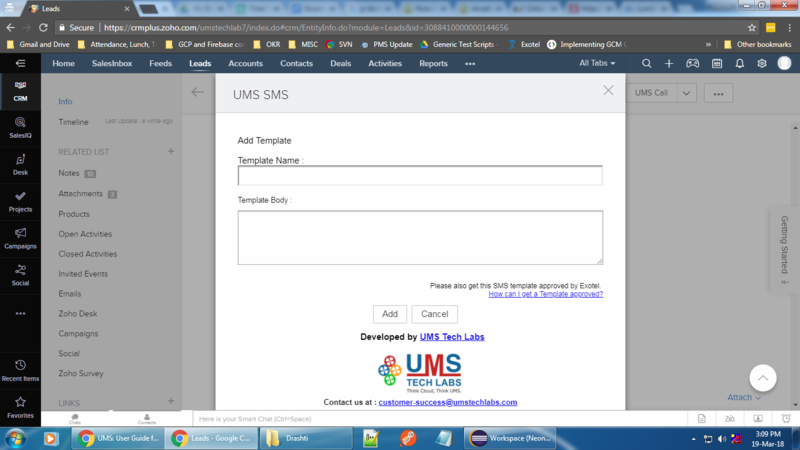 You will now be taken back to the “Send SMS” popup where you can select the newly added template from the template list drop down. The content automatically appears in the template body area. Now click on the “Send” button to send the SMS to the customer. 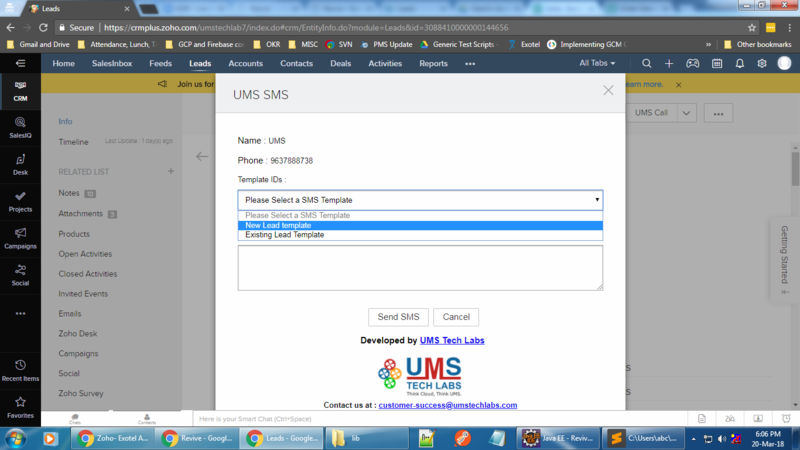 SMS History records all the outbound SMS details for each Lead/Contact. Number: Number of the customer to whom the SMS was sent. Date-Time: Stores the date and time call was made. Message Body: Displays the Content of the SMS sent. Status: Displays the delivery status of the SMS. In case of any queries related to ATSA, just write an email to us on customer-success@umstechlabs.com and we shall get back to you soon.